A policy change pertaining to uniforms at a Vermont military college has enabled a Muslim student to feel welcome on campus. Hamze is of Lebanese heritage, from Florida. She said she was born in the United States to parents who were, too. The 18-year-old recently started her first year at Norwich University in Northfield. Before Hamze enrolled, Norwich allowed a change to its uniform policy to enable her observance of the hijab, a form of modest dress by Muslim women. Hamze’s hijab must be in muted tones to match the camouflage of her recruit’s uniform, she explained. 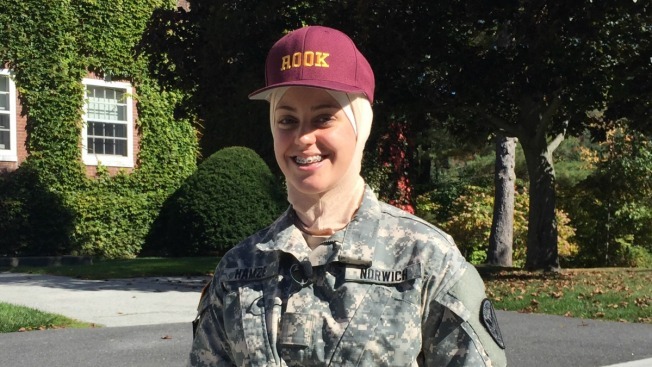 Over her hijab Wednesday, Hamze was wearing a school cap designating her as a recruit. Another part of her uniform that reflects her Muslim faith is how Hamze wears long sleeves and pants, she explained. Other students may have short sleeves. Hamze said she hopes to one day join the Navy, aiming to keep the U.S. safe, including from ISIS. Hamze was a part of national headlines earlier this year when South Carolina’s famed Citadel would not make such uniform accommodations. In May, NBC News reported president of the Citadel, Lt. Gen. John Rosa, pointed out that the Citadel accommodates students' religious beliefs in other ways, connecting incoming cadets with local houses of worship and meeting prayer and dietary needs. "The standardization of cadets in apparel, overall appearance, actions and privileges is essential to the learning goals and objectives of the college," Rosa said, according to the NBC report. "This process reflects an initial relinquishing of self during which cadets learn the value of teamwork to function as a single unit." Schneider noted that Texas A&M University had approved a similar religious accommodation for a female Muslim student, and that its change was met without incident. Schneider went on to say he believes the decision will make Norwich a stronger university, and added that new regulations would also specify the proper wearing and color of the kippah and yarmulke for members of the Jewish faith who want to join the school’s Corps of Cadets. Norwich’s campus uniform store helped facilitate Hamze’s new attire, by communicating with the student before her arrival and by explaining options for ordering garments. Hamze said her accommodation has not impacted how she is treated by other students or during training sessions.